Saint Bartholomew’s Church was consecrated by the Episcopal Archbishop of Dublin, Richard Chenevix Trench, on 23rd December 1867. 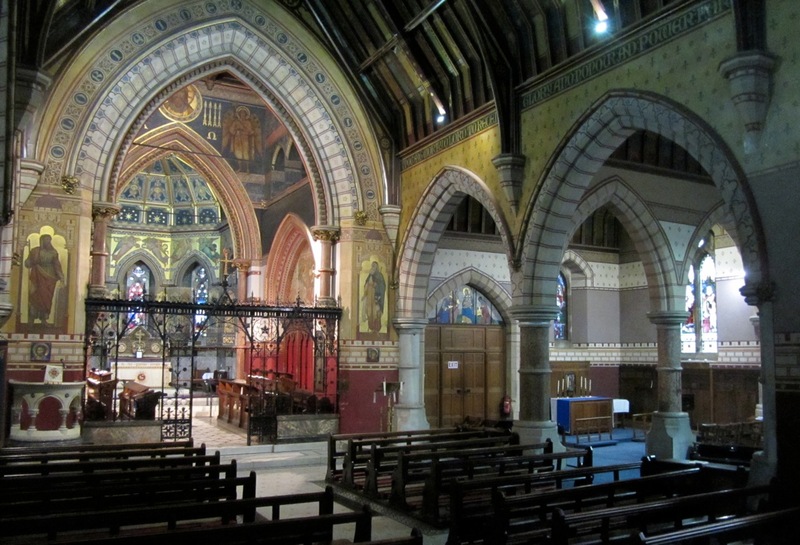 Profoundly Tractarian, both in its architecture and decoration, the building has always been exceptional in the story of Church of Ireland building and remains, to this day, the most striking example of Episcopal High Church design in Victorian Ireland. Both in its architecture and interior decoration it is, in many ways, unique. Though a Dubliner, Archbishop Trench (1807 – 86) was educated in England, at Harrow School and at Trinity College, Cambridge. He had been Dean of Westminster Abbey before his translation to Dublin and there can be no doubt that he was much more at home with the ideals and concepts of High Anglicanism in London than with the normally low-church attitudes that prevailed in Dublin. Following the disestablishment of the Church of Ireland under Gladstone, which took effect from January 1871, Trench took on the essential role of protecting the Protestant Episcopal tradition while at the same time encouraging, by his own tolerant views, a type of high churchmanship that was at odds with many of his contemporaries in Ireland. Trench’s appointment, opposed both by the Prime Minister, Lord Palmerston and by the Lord Lieutenant, the Earl of Carlisle, was to set the archbishop on a collision course with much of the Irish establishment and Saint Bartholomew’s church, whose pioneering vicars he unflinchingly supported, was to be the battleground of much that he stood for. A view of the church from the south west. The architect intended a spire to sit on top of the octagonal belfry. The rapidly growing Pembroke District to the south east of Ballsbridge in Victorian Dublin was the urban area for which a new parish was constituted in 1864 and where a committee had already been formed to raise funds and supervise the erection of a church. Two men, who each served on this committee, brought the present building into being: Arthur Altham Dawson, vicar from 1864 to 1871 and Richard Travers Smith, vicar from 1871 to 1905. Dawson, had been Trench’s domestic chaplain and was the preferred candidate of the archbishop however, after seven years he resigned at the age of 39, when Smith succeeded to the incumbency. 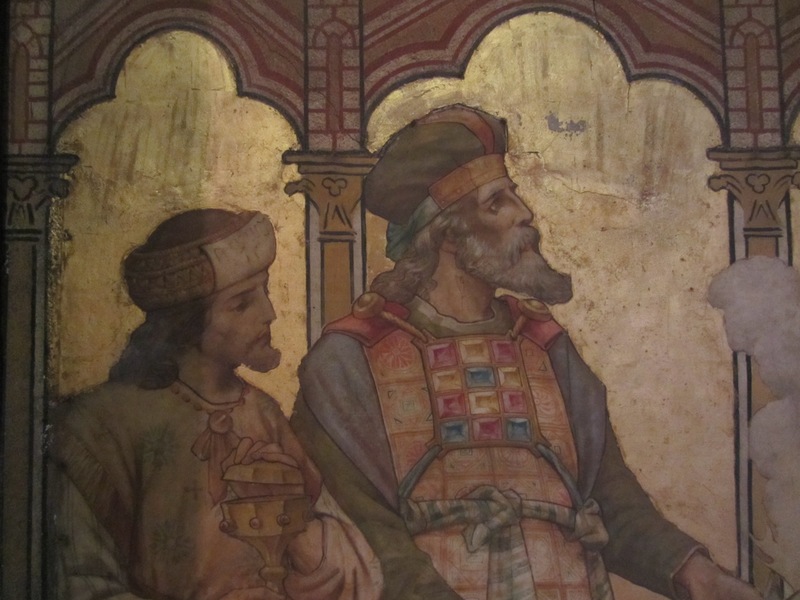 Smith was a man of considerable personal wealth and it fell to him to institute and complete the ambitious programme of murals and decorative enrichment in the chancel and sanctuary, which give the building its distinctive quality. 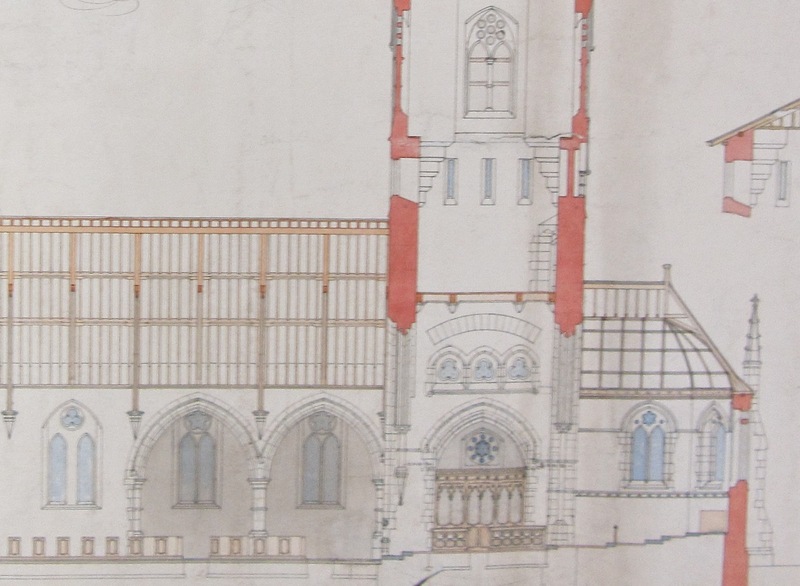 The importance that the church authorities attached to the project is illustrated by the fact that in 1863 five architectural practices were invited to submit a portfolio of drawings to the committee to assist in its choice of an appropriate designer for the building. Two of the practices were notable Irish firms: Lanyon, Lynn and Lanyon of Belfast and Sir Thomas Newenham Deane in Cork. The other three architects were English: William Slater, Robert Withers and Thomas Henry Wyatt. In the event it was Wyatt who won the commission, almost certainly because he enjoyed the backing of the Herbert family who were the landlords of this part of Dublin, and who, as Earls of Pembroke, were to give their name to the new district. Wyatt (1807 – 1880) was thoroughly versed in the principles of Gothic architecture and had a notable practice as the designer of more than 30 churches in England before he won the commission for Saint Bartholomews. In 1841 Wyatt had designed a huge Romanesque church for the Herbert family at its principal estate of Wilton, outside Salisbury in Wiltshire, and he had worked closely with Sidney Herbert, the younger brother of the earl who administered the family estates. When in Ireland Herbert lived at Mount Merrion and, though he died in his early 50s in 1861 three years before Saint Bartholomew’s was founded, it is he who is said to have donated the site for the church. 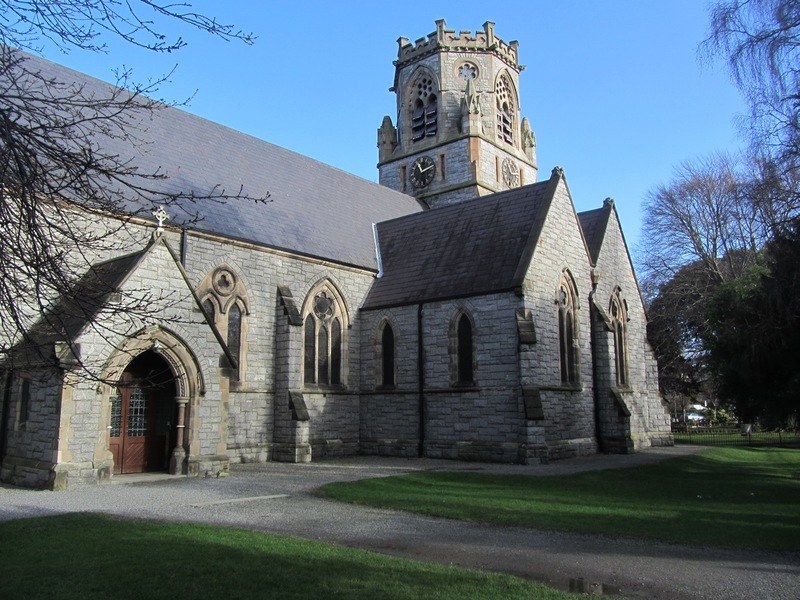 Inevitably the Herbert family took a direct interest in the planning of the new Pembroke District church, so much so that the appointment of Wyatt as architect seems to have been a family affair. 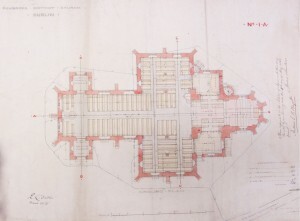 Sidney Herbert had been at school in Harrow at the same time as Archbishop Trench while his brother-in-law the 3rd Viscount de Vesci had also employed Wyatt both at Abbeyleix house, Co, Laois and on the nearby church of Saint Michael & All Angels, a building that was largely paid for by de Vesci. 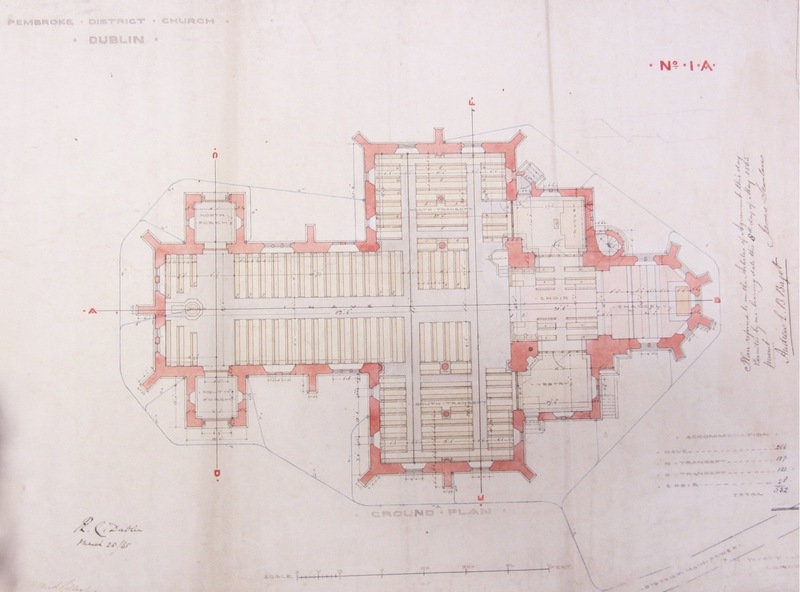 When the foundation stone of Saint Bartholomew’s had to be laid it was Lord de Vesci who performed that ceremony, while the builder of the church, James Scanlan, had also been employed at Abbeyleix and was particularly promoted by the architect. The construction of the church lasted for a little over two and a half years. 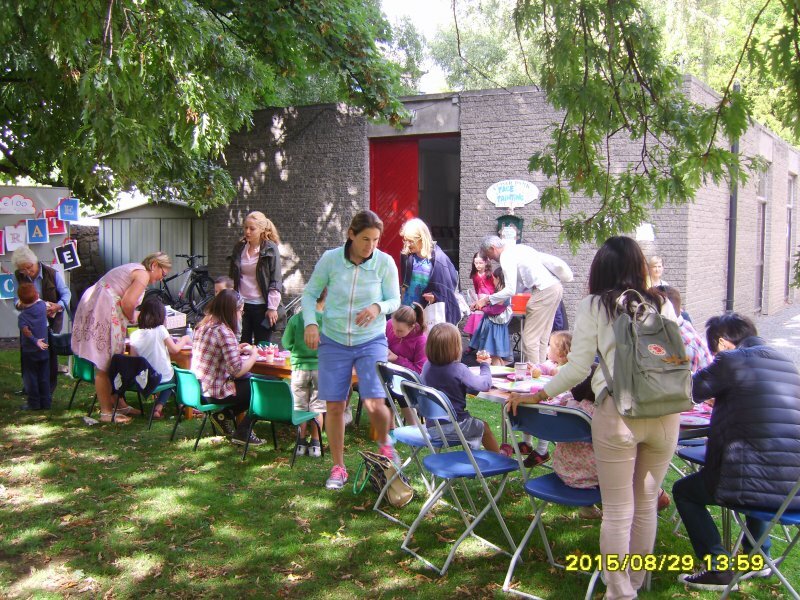 Building began in May 1865 and the church was completed and consecrated just before Christmas two years later. 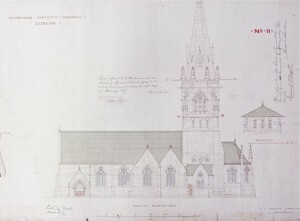 The south elevation of the church as proposed by Wyatt, including the un-built spire. We are fortunate that a set of Wyatt’s original designs for the building survive. With the exception of a spire over the belfry tower, which was planned but never constructed, Saint Bartholomew’s was executed exactly as its architect intended: the plan is identical to the church today and the exterior elevations reproduce all the variety of the different heights of the separate parts – the nave roof, the gables of the transepts, the chancel and the entrance porches – that appear in the drawings. Wyatt’s design for Saint Bartholomew’s was beautifully detailed and it made generous provision for the new congregation. 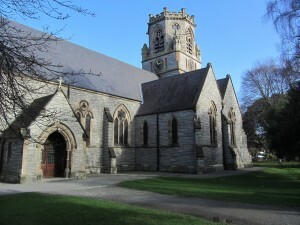 The building is a large Gothic Revival church, laid out on a traditional cruciform plan of nave, transepts and chancel. 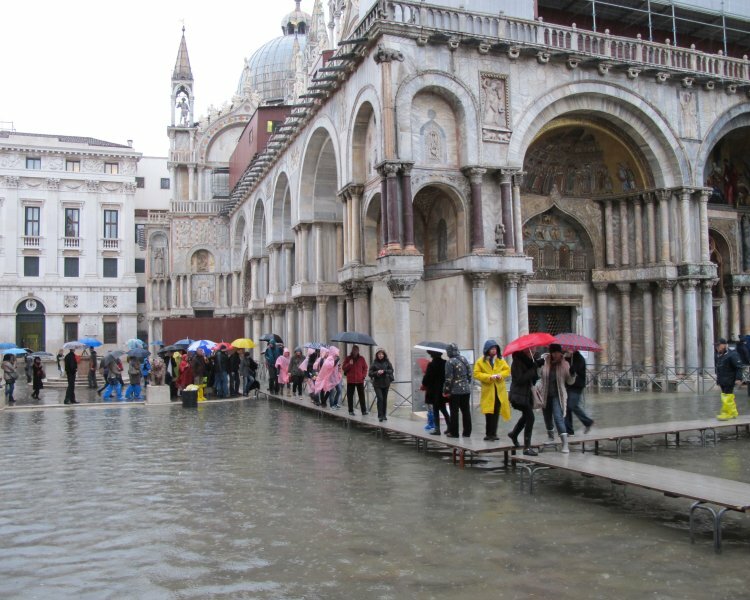 Its dimensions are substantial: 128 feet from east to west and 77 feet wide from north to south across the transepts. It is oriented ‘correctly’ with the chancel, which is polygonal, facing east however the design introduces a number of less common features, most notably in the handling of the transepts and in the accommodation of the choir. The chancel and south transept seen from the nave. Each of the transepts is screened from the nave by a pair of low double-chamfered arches so that the effect of the view down the nave is one of an unbroken focus on the chancel arch, with the sanctuary arch beyond. Such an arrangement means that the additional sense of space created by the transepts cannot ever dwarf the volume of the church since each is roofed by a pair of timber wagon-roofs, supported on more double-chamfered arches set at right angles to the line of the nave. All these arches spring from substantial circular piers of polished brown-red marble with half columns of grey limestone attached to the walls. The effect is one of sombre richness with a sense of architectural solidity that supports the exceptional height of the chancel arch opening into the choir. 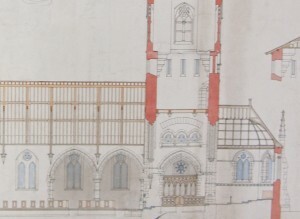 A detail of Wyatt’s section of the church showing the north transept arcade, the choir, as first planned and the chancel. Wyatt’s second unusual feature is seen in the positioning of the choir under the square of the church tower, which sits directly above it. 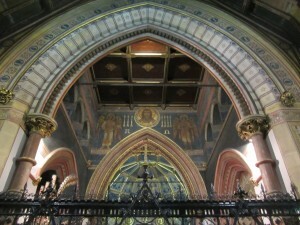 As a consequence the choir occupies a uniquely lofty space that rises to a flat, beamed ceiling much higher than any other part of the building, so that the sanctuary arch, opening out of it, can be clearly seen in its entirety and provides a dramatic prelude to the intimate Gothic space of the altar room. 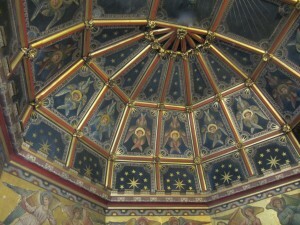 A view from the chancel arch to the ceiling above the choir. 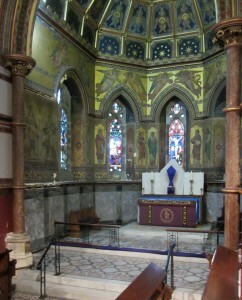 A view of the sanctuary with the mosaic floors and painting designed by T.M.Deane. A careful analysis of the interior will reveal Wyatt’s scrupulous gradation of the weight of the architectural detail and the increasing modelling and richness of the interior as the visitor moves from the back of the nave – where the entrance porches open into plain walls – to the drama of the choir and altar in the sanctuary. The changing patterns of the timber ceilings in the building underscore the same concern: the roof of the nave offers an alternating succession of braced and plain king-post trusses, with exposed purlins and rafters; the transepts have polygonal timber wagon roofs while the ceiling of the sanctuary is closed by a radiating pattern of timber coffered panels between complex chamfered ribs. Detail of the sanctuary ceiling with the six-winged angels described by Saint John in the Book of Revelation. There is therefore a strongly marked architectural response in the design of the church to the ritual intensions that lie at the heart of the building. 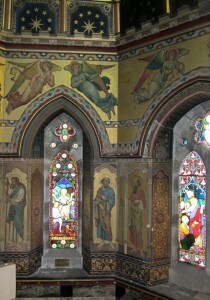 During the incumbency of Richard Travers Smith this intrinsic quality of the architecture was to be enhanced by an exceptional scheme of decorative and figural paintings. 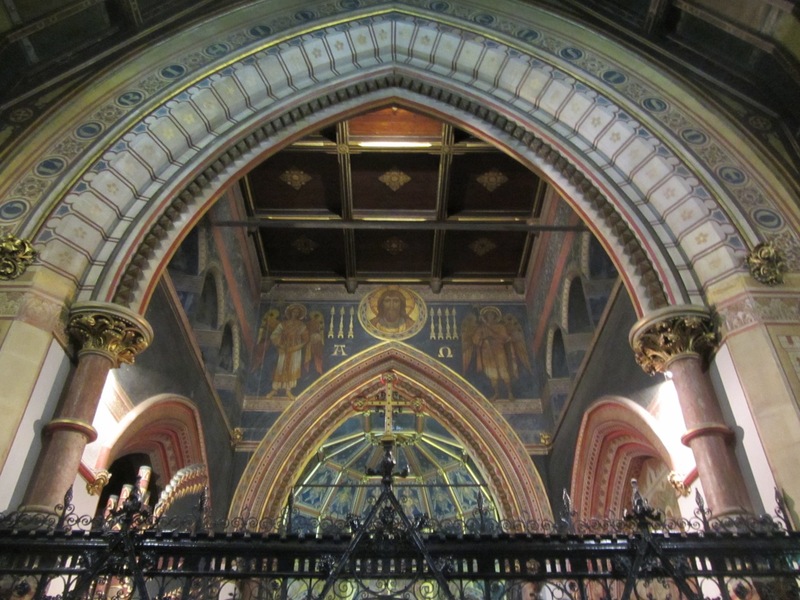 The scheme for the painted decoration of the interior of the church is the work of a different architect, Thomas Manley Deane (1851 – 1932), who was employed by the second vicar, Richard Travers Smith, to develop an interior of unique richness. Deane’s designs were approved by the archbishop in February 1874 and were carried out over a number of years. The first part of the church to be decorated was the choir and sanctuary. 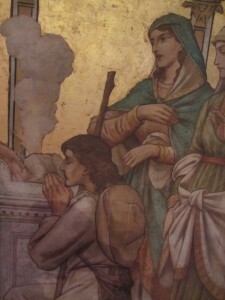 Detail of the painting in the chancel, showing figures of saints and the angels holding the ‘Arms of Christ’ above. Quite remarkably for a Protestant church of any denomination at that time, figures of saints line the walls and are shown standing within a series of painted architectural niches. They are big figures, five feet high, and two of them, King David on the north and Saint Paul on the south are drawn so that their arms appear to pass behind the elongated columns that separate the niches with David’s harp and Saint Paul’s sword shown in the next niche. Deane prepared detailed drawings for all the coloured patterns that are used in bands on the walls and on the different mouldings on each of the archways. 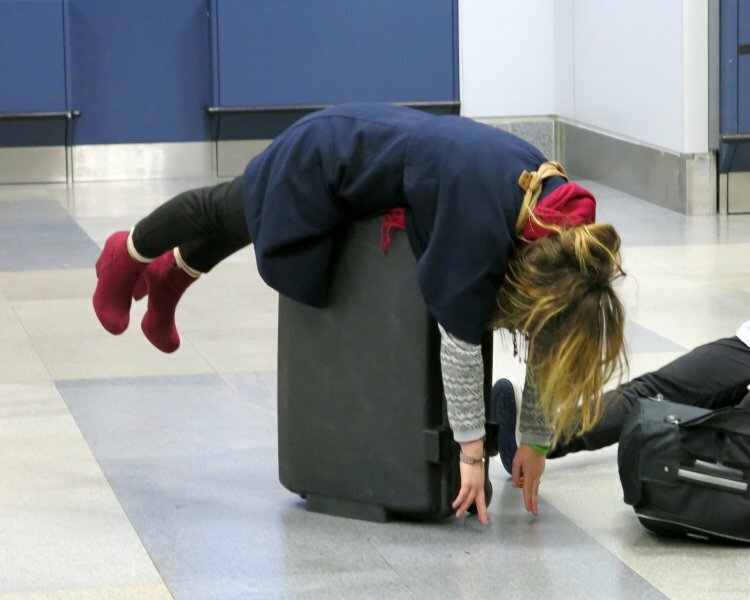 His scheme is very learned and highly elaborated. 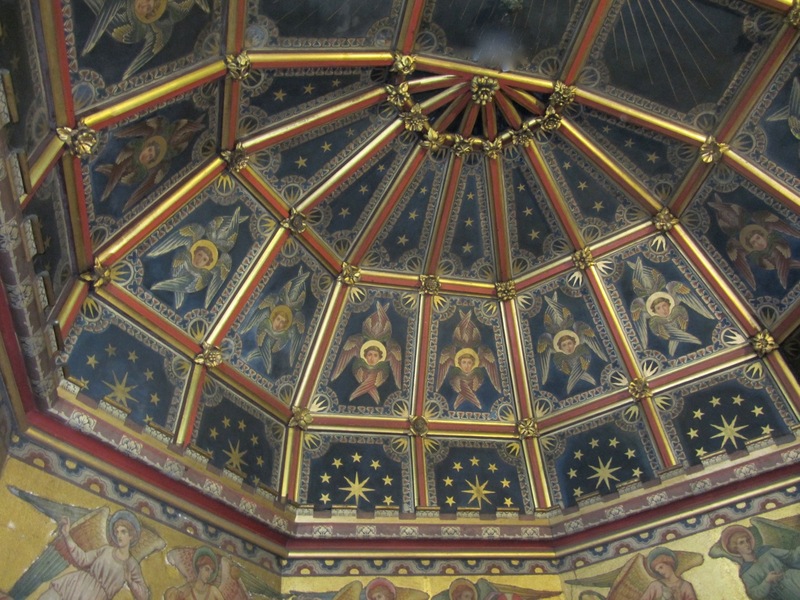 The roof of the sanctuary is painted a deep cobalt blue and has the six-winged angels described in the Revelation of Saint John floating amongst stars in the panels of the ceiling. Above the eastern arch of the choir the archangels Michael and Gabriel flank the portrait of Christ set in a circular mandorla. 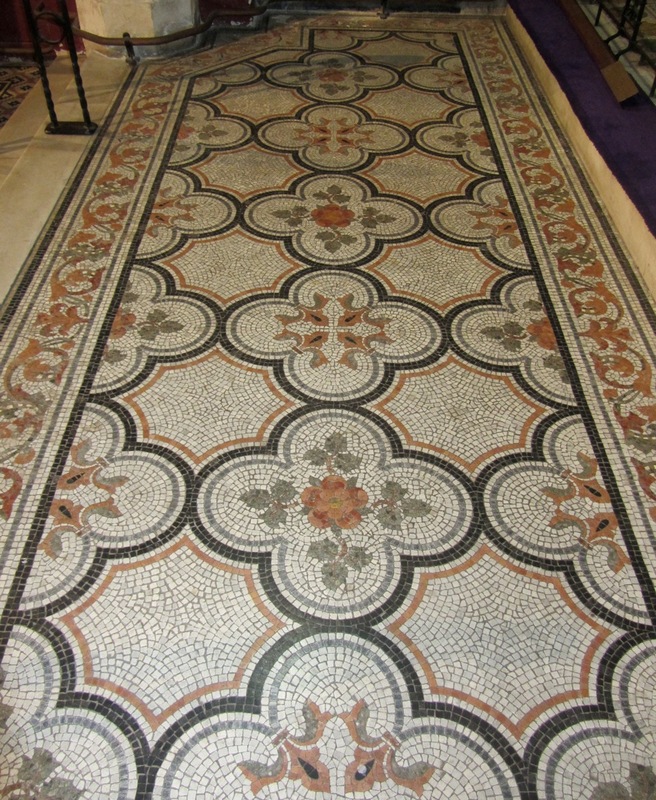 Deane claimed that he drew the inspiration for these designs from the twelfth-century decorations in the Cathedral of Monreale in Sicily which he had studied particularly with the commission of Saint Bartholomew’s in mind. Though Deane prepared the overall scheme for painting the sanctuary and the choir, the finished painting of the figures was carried out in London by a Mr. Smith, one of the principal draughtsmen of the firm of stained glass makers, Clayton & Bell. This work is executed in a technique known as ‘spirit fresco painting’ where the image is painted in flat pigment on a canvas, which is later applied to the wall surface. 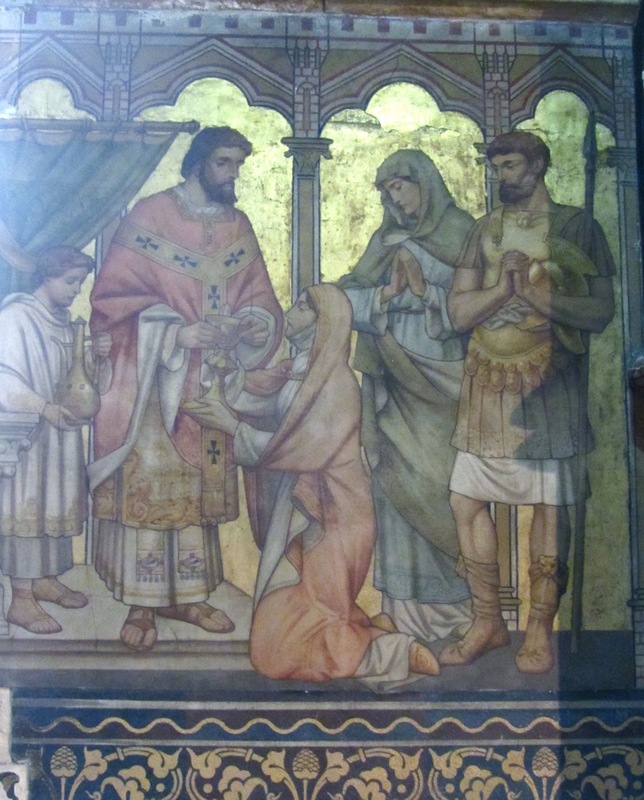 Modern sacrifice: the communion of Constantine and S. Helena. Detail of the Ancient sacrifice: figure drawing by artists from the firm of Clayton and Bell. Detail of female figures at the ‘horned altar’ in the Ancient sacrifice. The spirit fresco paintings in the church are the old testament figures and saints who line the walls in a decorative band between the windows; the two figurative compositions depicting an ancient sacrifice at the horned altar of the Temple in Jerusalem and the ‘modern’ communion of Constantine and Saint Helena; the angels in the upper layer of the sanctuary who – unexpectedly – bear the ‘Arms of Christ’ that is the physical objects which feature in Christ’s passion; the six-winged angels described in the book of Revelation and the archangels Michael and Gabriel that flank the portrait of Christ on the east wall of the choir. The mosaic pavement in the choir designed by T. M. Deane. 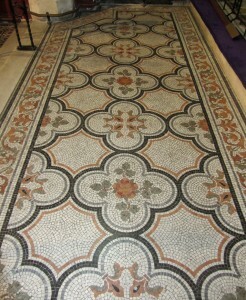 The mosaic pavement of the sanctuary. 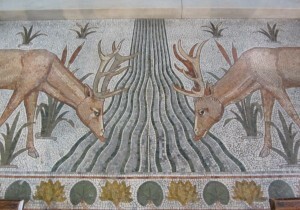 A mosaic picture of deer drinking at a stream flowing from the altar table. 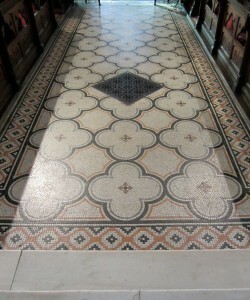 As well as the painted decoration of the interior, the mosaic pavements of the church were designed by Deane and reflect a similar scheme of increasing richness as the visitor moves from the nave to the passageway between the choir stalls, and across the sanctuary pavement to the altar rail. 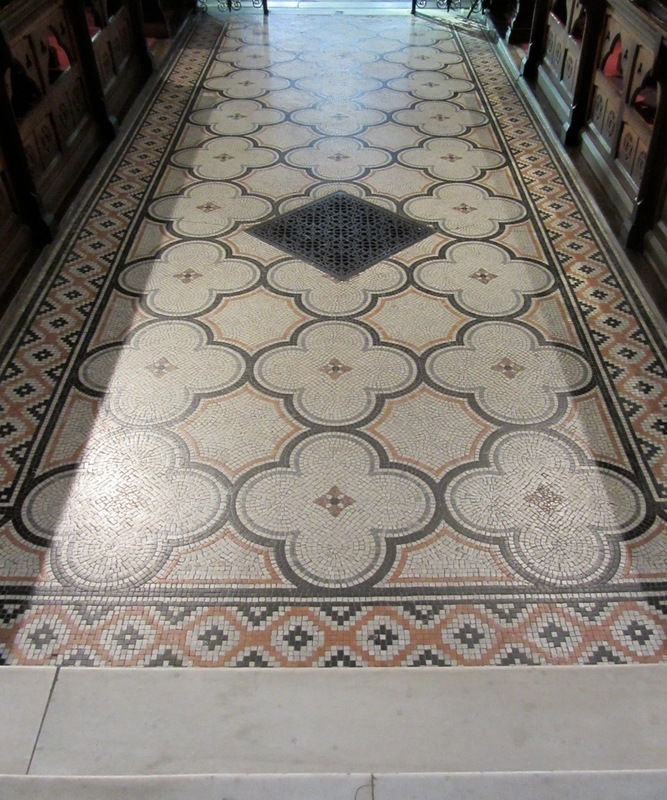 In the nave the pavement is in black and white with a border of intersecting and overlapping square crosses; within the choir the pattern changes to a network of quatrefoil panels picked out in black, blue-grey and earth-pink while there is a diamond border in black and pink; within the sanctuary the pattern of the choir passage is enriched with fleur de lys and single roses which fill alternate quatrefoils and the border is a flowing pattern of green-grey and tan foliage. 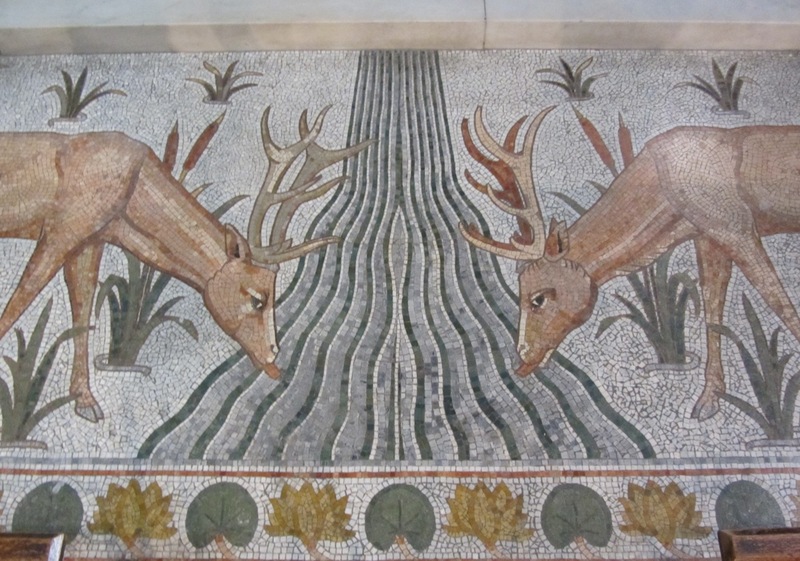 At the altar rails the mosaic pavement changes again depicting two deer which bend their necks to drink at the stream of water which flows from the altar step. 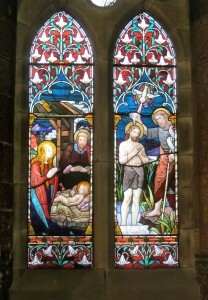 Stained glass window by Michael O’Connor in the chancel: the Nativity and Baptism of Christ. 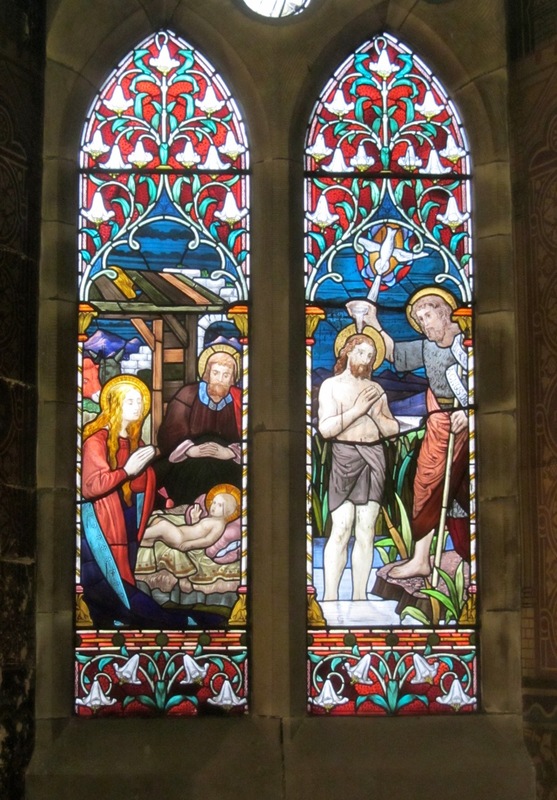 It is significant that the support for the church by members of the parish in the nineteenth and early twentieth centuries has meant that not one of the twenty five windows in the building has remained as plain glass. 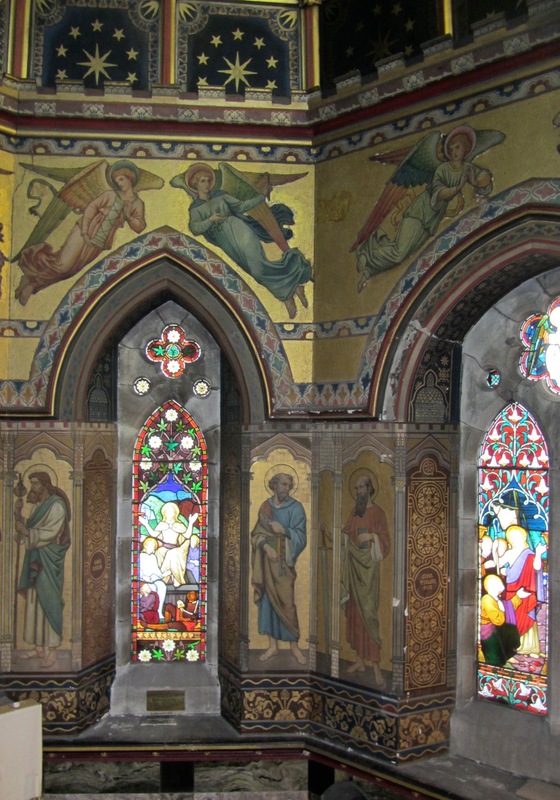 This remarkable collection of Victorian and Irish stained glass in Saint Bartholomew’s is illustrated and meticulously described in David Lawrence’s Gloine database of Church of Ireland stained glass.